I love the premium themes that Adii and Magnus have been creating and “Fresh News” is the latest addition to their collection. They really have established themselves as the premium WordPress design leaders and rightfully so. 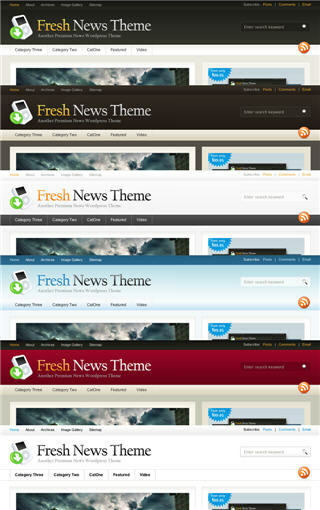 The Fresh News them comes with six different built-in color schemes which can be easily changed from within WordPress. The available colors are the default one, brownie, grey, ice blue, simply red, and whitey. The cool part is additional color schemes will be released in the future and will be available free of charge. This theme design as you can tell is of top quality work and the template code is well written. This theme can of course be used for any sort of blog or website so if really want to make your site stand out from the rest so if you’re looking to spend a little money to buy a great WordPress theme then this is a great one to buy. Gotta love all the features and layout for less than $100. I promise, you won’t be disappointed. Single License ($99.95) – This package is for the person who intends on using this theme on a single website. Included in this package, is the full theme with all of its features and modules. The credit link is not required to stay in tact. Theme presents problems for my. very nice! There are also free theme? Theme worthy of good attention! Nice themes! I like the Features.